Walkers have a choice of interesting tracks around Buninyong; some in the heart of town are easy for all, others are more vigorous as they climb the many steep volcanic cones ringing the township. 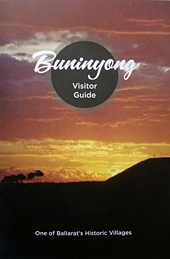 See Walks Around Buninyong and District for maps, descriptions and points of interest on a wide range of interesting walks around Buninyong. Gravel paths with gentle gradients wind amongst lawns shaded by mature trees and over small bridges crossing a small stream and ponds in Buninyong's atmospheric Lower Botanic Gardens. Facilities such as a rotunda, children's play areas, barbecues, and toilets make this restful place popular for picnics. In the Upper Gardens, another level path skirts The Gong, with steeper tracks leading up to the Catholic Church and to Mt Innes. A level gravel path runs through Desoza Park for a kilometre or so along both sides of the Union Jack Creek, making an easy circuit walk. It is suitable for prams, wheelchairs and bicycles. The eastern end of the park, next to the Information Centre, has a rotunda, children's play area, barbecues, and toilets. Distance: 3.9 km; Time: 1 hour, 30 minutes ; Difficulty: Grade 3 (one steep hill). Start at De Soza Park. Distance: 4.7 km; Time: 1 hour, 25 minutes (more if Bird Park is visited); Difficulty: Grade 2. The Buninyong Bird Park Circuit is documented fully on Walks Around Buninyong & District, a website featuring local walks with provide plenty of support information. It has a detailed Summary Sheet, Walking Notes, Background Information on points of interest and a downloadable Geo-referenced Map. The website also allows for walkers to contribute photos and data concerning birds and plants identified along the walk. A 72 hectare area of bush on the north-east corner of Buninyong that was extensively mined in 1857. A maze of bush tracks wander through the old gold mining area. Long Walk: 2 hours, Difficulty: Grade 3. Includes the Locomotive Mine, one of the few accessible mine shafts left near Ballarat. Difficulty: Grade 4. Narrow track, steep sections, steps. Ideal first training for the Kokoda Track. If the Kokoda Track was a 10, this would be a 3. Distance 12 km; Time: 3 hours, 30 minutes; Difficulty: Grade 3. There are three short steep sections. Part of the Wallaby Track section of the Goldfields Track developed by the Great Dividing Trail Association, the Buninyong Walk starts gently at the eastern end of The Gong, following the Yuille St reserve then climbs quite steeply up to Mt Innes where there is a seat and good views. From there, the track continues up to the summit of Mt Buninyong. The Goldfields Track (Mt Buninyong to Bendigo) is 210 km. The Wallaby Tack (Mt Buninyong to Daylesford) is 90 km. 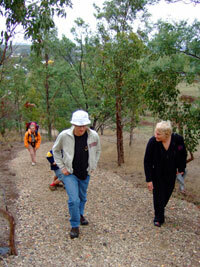 See the Great Dividing Trail Associationwebsite for more info about the Victorian sections of the GDT. See also the new Goldfields Track website which covers the 210 km Goldfields Track all the way from Bendigo to Mt Buninyong, via Castlemaine, Daylesford, Creswick and Ballarat. The website includes links to maps of the Goldfields Track embedded on both Garmin and Google Maps, that you can use or download on a smartphone or other mobile device. 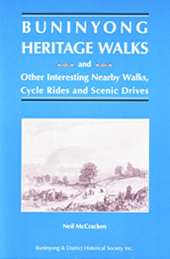 Walks Around Buninyong & District has many interesting walks with maps, background information and walking notes. Some maps have embedded GPS co-ordinates; some are still being developed.